So, which version of the Lhurgoyf was I happier with; Ice Age or 8th? Well, Ice Age gets the nostalgia vote but 8th is a better painting – as I’d hope given that over half a decade separates them – but unfortunately some of that didn’t translated as well to final print size as I would have liked. If I’m looking at the two originals then I prefer the newest. If I’m looking at the printed versions then I like them equally; this probably means I didn’t take reduction into account enough when doing the new piece. Also the new piece was painted about twice the size of the old version so these things can be more difficult to get right the greater the reduction to final print size. Maybe with more time I’d have given the new Lhurgoyf a little bolder texture, hard to say. The only unfortunate thing about the actual printed card is that it dropped out a few of the mid tones (a printing issue I would spot again throughout Mirrodin and especially on Tanglewalker). The printing made the image more heavily contrasted which has the benefit of increasing the dynamism but at the expense of the subtler qualities that make the creature’s skin look more realistic. So what would I do now? The current sketch’s readability issue was really just related to where the head was, so I moved the head up to the upper left of the image. This kept the center of the figure uncluttered, gave the head a prominent location in the image and filled a growing area of dead space in the upper left of the picture. Win/Win! It fixed a whole host of issues and as a bonus, also gave the Lhurgoyf a more defiant, aggressive look. Probably a good thing as WotC wanted an image that exemplified the power of a pumped-up Lhurgoyf. The rejection of the first sketch came as a blow, especially given how long I’d spent trying to nail down a composition I was happy with. 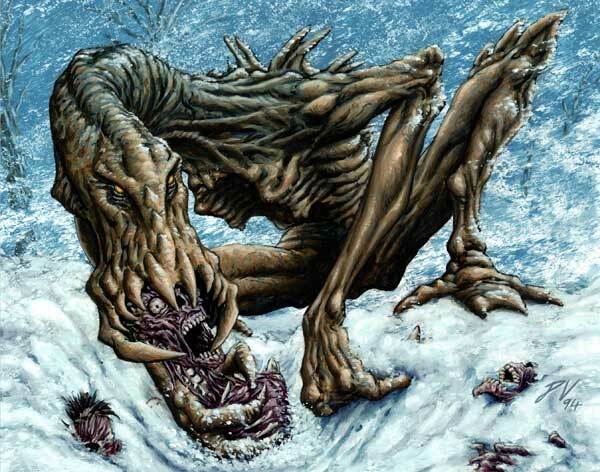 The people responsible for signing off on Magic art (chiefly the art director and at least one member of story and R&D) felt that the Lhurgoyf was too thin and lacked the power that was associated with this fearsome creature. I pointed out that the new Lhurgoyf was actually a little more muscular than his predecessor, but this fell on deaf ears. They wanted me to make him bigger and tougher. I had to scrap the foreshortening notion as that was going to be counterproductive to making the figure look larger. Okay, so what the hell do I do now? Having decided that I need to significantly boost the image’s dynamism, I tried to get the Lhurgoyf running. Remember this guy? 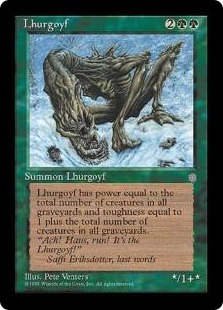 Ice Age’s Lhurgoyf was one of my first encounters with having a card that generated a LOT of excitement upon its release. Sure, ‘The Abyss’ is still the most expensive card I’ve drawn but at the time of Legends launch, a lot of cards were jostling for the limelight. But at the Ice Age release event that I attended, the buzz was all about the Lhurgoyf. This way for Lhurgoyf sketches.